When using a 3D path, the X, Y and Z functions work together using the same keyframes. This allows for the velocity to control the curve and create a smooth trajectory. Even if a function does not have any variation on its curve (for example, all keyframes are at zero), the velocity might add a slight motion to ensure a smooth trajectory. This can cause elements that are very close to each other on the Z-axis to pop in front of one another. This is why in cut-out animation it is recommended to use separate position settings. But if you work with 3D path, you can use the Constant Z feature to avoid this from happening. 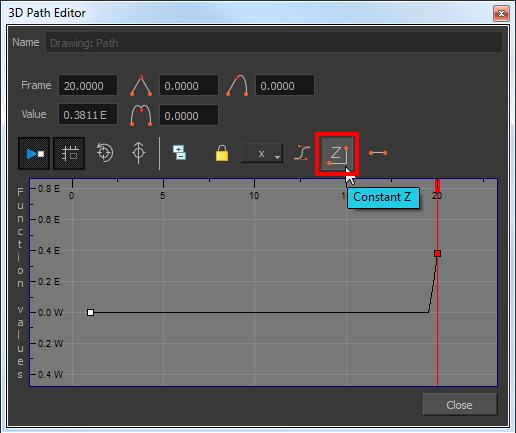 The Constant Z feature is used when creating motion keyframes. The Z function will use stop-motion keyframes and will not be interpolated, which can be very useful for cut-out animation. The Constant Z feature only works with 3D paths. You can also enable the Constant Z option directly in the Function view for specific functions. In the Timeline view, expand the layer on which you want to set the Constant Z feature. Note that you must select the 3D Path option for the layer. Double-click on one of the position functions to open the Function editor. In the Function editor, select the Constant Z button.